Sorry we haven’t been posting as much this week. There is a LOT to say but it’s been hectic getting used to our new schedule. We don’t really know what we’re doing each day until someone shows up at our dour and says we’re supposed to be somewhere in 5 minutes. To catch you up to speed we arrived on Monday and had a tour of the whole compound. It’s quite extensive and really nice. There’s a whole parochial center where they have hundreds of young people come Saturdays and Sundays for Sunday-school type stuff and preparation for the sacraments. Today I was in a life-teen-like praise and worship session with close to 150 teen-age girls (very impressive I think). There’s also a kindergarten with over 250 kindergarteners, and a preschool with another 50-80 kids under 5. It’s no surprise they can use extra hands around here. Then there’s also an orphanage with 80-100 girls (?) ages 0-18. I haven’t seen all the girls together yet but I saw a lot of beds. There are just a LOT of kids in this town and they all need to learn some good, Christian values. That’s where we come in. 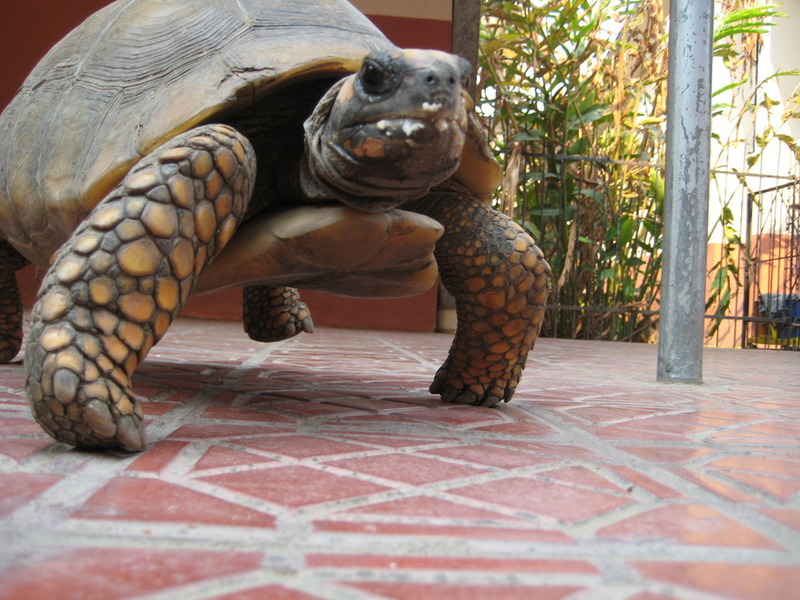 Below is the tortoise that lives at the orphanage. So then Tuesday we tried to go to Santa Cruz for the first time to start our visa process. We went to morning mass which is at 6:45am in the church on the Plaza. 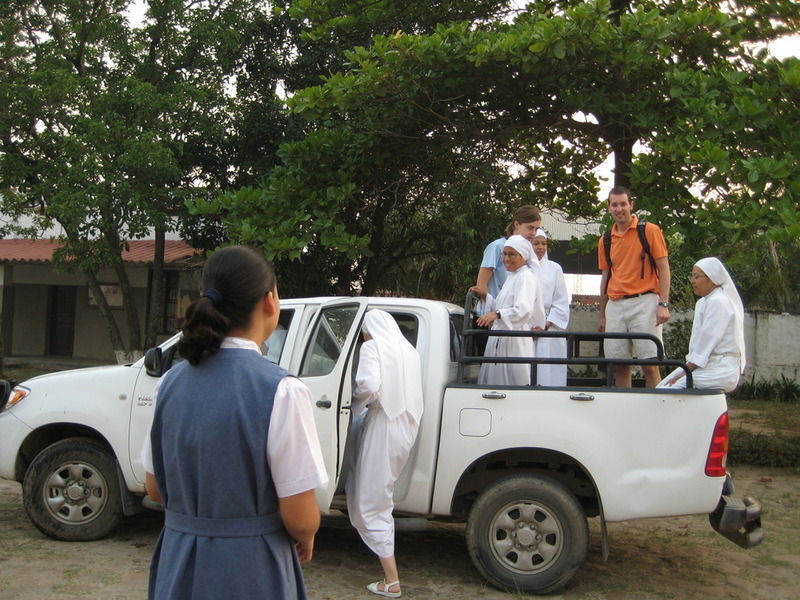 It’s pretty hilarious seeing all the sisters pack into one truck to go to church (there are 12-15 including postulates here). When we got to church at 6:40 there were already a bunch of people there and then this group of women marches in with a loud speaker saying the end of their walking rosary (who knows what time they started) which appears to happen daily because the sisters are completely un-phased despite the fact that this woman is singing off key into a loud-speaker, now inside of the church. Anyway then mass starts with some rousing synthesizer beats and an opening song from the guy upfront with an electric keyboard and a microphone. Keep in mind it’s still 6:45am and I am not a morning person. It was an experience. After mass we went to try to get a trufi (see definition below) to Santa Cruz but on the TV they reported there was a blockade between Montero and Santa Cruz. Apparently some merchants who wanted better spots to sell their wares decided to sit in the road for a few hours to make their point. It seems to be a pretty popular form of political protest here. Anyway, we decided not to go to Santa Cruz to avoid any political entanglements. So instead we stayed in Montero and worked on getting the necessary paperwork together for FELCC. Trufi: a car or minivan with extra seats stuffed in. You pay $1 to ride an hour to Santa Cruz sans air conditioning sitting shoulder-to-shoulder with your closest stranger. For example your retro-fitted family minivan holds 7 passengers and a driver. Two of those lucky passengers ride up front and the really lucky one is shoulder-to-shoulder with the driver, legs trying to avoid the stick-shift that is right in front of you. I had that seat on the way back one day. Not great. This entry was posted in Bolivia by Laura. Bookmark the permalink.